Chinese state-run television has revealed China almost ignited a war against the United States in July when it aimed "dozens" of DF-21D anti-ship ballistic missiles (ASBMs) at the aircraft carrier USS Ronald Reagan (CVN-76) patrolling the South China Sea. This startling admission was made on state-owned China Central Television (CCTV) this week. 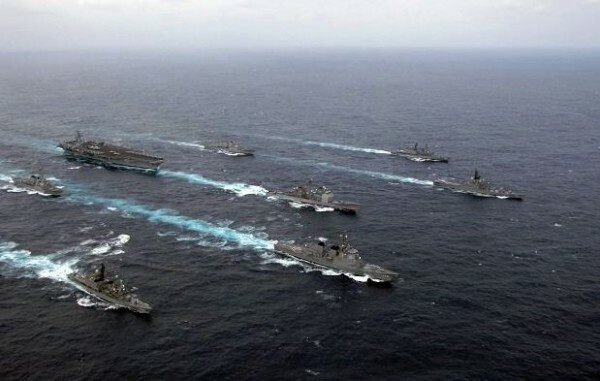 It also revealed this action that might have triggered a war with the United States occurred a few days before the Permanent Court of Arbitration in The Hague on July 12 declared illegal China's claim to own most of the South China Sea based on "historic rights." CCTV said the People's Liberation Army Rocket Force (PLARF) almost launched its DF-21D ASBMs at the USS Ronald Reagan then patrolling the volatile South China Sea. China saw the U.S. Navy's two Carrier Strike Groups in the South China Sea as an indication the U.S. was about to attack. It feared the U.S. might use its military strength to enforce the arbitration ruling. In response to Beijing's growing paranoia, the PLARF aimed "dozens" of its DF-21Ds at the USS Ronald Reagan, which is part of the United States Seventh Fleet. Attacking the Reagan, however, would have led to massive retaliation by U.S. warships and aircraft in the South China Sea. It might also have triggered an exchange of nuclear missiles, making World War III more than a dreadful scenario. At this time, the Reagan was conducting joint naval drills in the South China Sea with another carrier, the USS John C. Stennis (CVN-74) from the United States Third Fleet. The Carrier Strike Groups of the Stennis and the Reagan also consisted of two guided-missile cruisers and six guided-missile destroyers. Two nuclear attack submarines also accompanied these warships. The two Carrier Strike Groups in these aircraft carriers consisted of 140 aircraft, including 80 F/A-18 Hornets that can either engage in air-to-air combat or attack warships of the People's Liberation Army Navy (PLAN). This was the first two-carrier exercise in the Western Pacific in two years. The presence of the two carrier strike groups demonstrated the U.S.' unique ability to operate tandem forces in the same area at the same time and afforded a rare opportunity for joint training "in a high end scenario," said Rear Admiral John Alexander, commander of the Reagan carrier strike group. PLARF controls China's arsenal of land-based ballistic missiles, both nuclear and conventional. It is under the direct command of the Central Military Commission headed by Chinese President Xi Jinping. The DF-21D, which is hyped in Chinese media as a killer of U.S. aircraft carriers, is an untested, road mobile ASBM with a maximum range of 1,450 km. The DF-21D is thought to employ maneuverable reentry vehicles (MaRVs) with a terminal guidance system.